The Upaya Yoga teacher training program is an all-inclusive, Yoga Alliance approved, 200-hour course. The program is especially sketched out by our team of gurus at Upaya to introduce students to their journey of evolving into expert yogis and able teachers. The course paves a path for its students to transform into becoming a yoga teaching expert and the program includes skilled teachers to provide students a strong foundation in Hatha and Ashtanga yoga. We have designed the program to be an enjoyable, unperturbed and enlightening experience. Upaya Yoga Center offers several choices of accommodation including Luxury A/C Apartments, A/C Rooms, and Large Eco Huts. Enjoy stunning sea views, views of the river and surrounding hills or the gardens. The path to transforming into a yoga guru is a lifetime process of learning and India, being the capital of yogic philosophy and spirituality, is the optimum location to develop a strong foundation of internal discipline. The Teachers Training Course (TTC) is a rigorous and transformative experience and at Upaya Yoga we ensure that the curriculum is fully comprehensive with assured personal attention to each student. Upaya Yoga teachings are different from many other yoga schools as the focus on the full spectrum of the yogic path and ashram life, not only asanas (postures). The course also covers alignment, adjustment, anatomy and teaching practice. 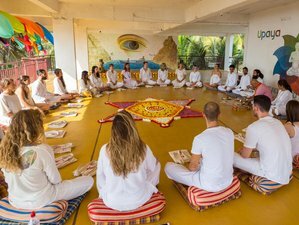 Students will get to experience meditation, breathing (pranayama), cleansing, chanting, mauna (silence), pooja (worship), kirtan (sacred singing), and other important aspects of the yogic path. Upaya Yoga Teacher Trainings offers the perfect balance of comfort and tranquility in a natural setting for your yoga practice. Praba was born into a family of yogis who practice in the Ashtanga style that characterizes the south Indian yoga tradition. He is a talented teacher and teacher trainer and has been teaching for over six years. Through expert adjustments and a deep understanding of asana, his students’ abilities, and injuries, he is able to push his trainees to the next level in their personal practice as well as their own teaching. Dr. Anita Rawandale (Urja) is a graduate in the ancient medical science of India that is Ayurveda. She completed her B.A.M.S. degree from University of Pune, in 1995. She has been working for many years at Osho Commune International Department of Health and Healing. She has developed the passion for teaching the healing body arts and yoga therapies. She has been working with many private organization and Institutes including Shaki Ayurveda Latvia, Suryamarga Yoga (Italy), Osho Kivani (Italy). She has trained students under her personal attention in Korea, Netherlands, Germany, France, Spain. Prem was born in Lumbini in west Nepal. Before moving to India three years ago, he completed his studies in Art but he still enjoys painting, playing guitar and flute in his free time. Prem joined Upaya Yoga more than a year ago and since then he has been a precious addition to our team. His creativity and caring personality manifest every single day when is preparing pure and delicious yogic food for our students. He never stops smiling to anyone who crosses his way. However cooking is not the only passion that Prem is sharing with us and our guests. Prachi was born in the northern part of India, Rajasthan. In her home state, she completed a master’s degree in sociology because she was intrigued by the different parts of human lives and how it affects social interaction. After this, she was still hungry for knowledge and finished a bachelor’s degree in education which gave her the opportunity to teach in secondary school, where she taught Hindi classes. She started her spiritual journey when she moved to Pune, where she lived near to the Ashram of Osho. She actively followed and practised Osho’s teachings daily for two years. Dr Nitin Patil born in Kolhapur, interested in Ayurvedic herbal medicines since childhood is what brought him to study deeper in the philosophy of Ayurveda. He runs his Ayurvedic hospital in Kolhapur with specialized Keralian detox healing procedures. His interest in the anatomy of the human body got him interested to teach yoga students a deep understanding about yoga postures, alignments, deeper understanding about. His deep understanding knowledge and experience in Ayurveda make him the perfect member of the Upaya Team. Jessica’s love for yoga started during her psychology studies in university. Besides being dedicated to the study of human thoughts and feelings and making humanitarian trips around the world, she felt like something was missing in order to follow her life mission of making this world a better place. She then discovered yoga and it completely changed her life and saved her. She then wanted to share this gift by becoming a certiﬁed yoga instructor. Having completed more than 500 hours of teacher training programs all across India and has been teaching yoga to kids and adults for a living. Prashant Pandey is a Yoga Teacher, Therapist, Astrologer and Acupressurist by profession with experience of 23 years in the field of yoga teaching. He belongs to Bihar School of Yoga and Bihar Yoga Bharati, Munger, Bihar. He was introduced to practical Yoga in 1991, at the young age of 20 through a Health Management Course conducted by Bihar School of Yoga. At the age of 25, he was given the first opportunity to serve, as a part of the team, for Jail-Yoga-Program (Prison Yoga Program) in various central prisons in Bihar state to teach yoga to prisoners serving lifetime imprisonment. Ayush discovered yoga in his childhood when he started to perform asanas as if it was a new game. Very soon this game transformed into an inexhaustible challenge and a spontaneous drive to learn more. Hence, despite the young age, he decided to move from his hometown near Delhi to Upaya in Rishikesh. As he was under the guidance of his father, Prem Krishna Ananda, and he was surrounded by like-minded people, the center proved to be the ideal environment for his yogic learning and personal growth. Ruchira Pandey is a Yoga Teacher & Therapist by profession with experience of 23 years in the field of yoga teaching. She belongs to Bihar School of Yoga and Bihar Yoga Bharati, Munger, Bihar, India. She was introduced to practical Yoga in 1983, at the young age of 12 through first children course conducted by Bihar School of Yoga. She has led Ashram Lifestyle for 10 years (1995 – 2005) under the surveillance vision of her Guru (Spiritual Master) Swami Nirananjananda Saraswati, the Chief Patron of Bihar School of Yoga and Chancellor to Bihar Yoga Bharati, Munger, Bihar, India. Chetan Bhadri was born and grow up in a Brahmin family in Rishikesh. He experienced yoga for the first time in his young age and was immediately amazed by its physical and spiritual benefits. He visited many teachers and by the time became an assiduous practitioner of hatha yoga. During those years he also attended the Sanskrit University in Uttrakand and obtained a Master’s degree in Sanskrit Acharya. The extensive study of the Vedas was a source of inspiration and the ideal support for a wider approach and understanding of yoga. Chetan considers yoga unlimited. One dreams of the perfect location when it comes to learning yoga that speaks of tranquility and peace. Goa is a perfect and idyllic infusion of such an environment, the breathtakingly beautiful azure beach and salty air will envelope you into a certain calmness of the soul. You are in for a world of experience in Goa. The blissful environment will encourage your skills to develop and is thus, by far, one of the most popular yoga retreat destinations in the world. There is a beauty in connecting with the self in such a pure and unadulterated setting when the only sound is the sea. The natives of Goa are heart-warming people and speak English among other prevalent languages. Goa exuberates love which makes is one of the most favored destinations for yoga trainings. Upaya Yoga Center is located at Arambol Beach, nestled in the shade of palm trees and tropical fauna just a one minute walk to the sea. Upaya offers the perfect balance of comfort and tranquility in a natural setting for your yoga practice. There is a dining room where are provided three pure vegetarian meals in accordance with the yoga lifestyle - except Sunday. Breakfast: Porridge, muesli, brown bread, fruit salad, sprouts, salads, herbal tea, coffee and milk. It may also be served a Traditional Indian Breakfast. Lunch: Traditional Ayurvedic Indian Thali, including rice, chapati (Indian bread), vegetables, salad, sprouts, beans, yogurt and lentils. Dinner: Combination of healthy Ayurvedic Indian food, cooked vegetables, raw salad, lentils and herbal tea. Other items may be ordered separately from our menu. All the food served is strictly vegetarian with no exceptions. It is not offered any non vegetarian food including eggs. All the food is well balanced and and protein rich. Complimentary pick up from Goa Dabolim Airport or Madgaon Train Station is provided for your comfort and ease to reach Upaya Yoga Center. Upaya Yoga Teacher Training is a traditional center delivering a deep yoga and meditation approach and a strong practice through all courses and yoga retreats. Please note that the rates below include a special discount offered exclusively to the guests reserving on BookYogaRetreats.com. To benefit, secure your spot right away!